Club Penguin Cheats by Mimo777 Club Penguin Cheats by Mimo777: Orange Penguins Bring Orange Puffles! I am not... but in like 30 seconds, I will be! Cool i know there is orange puffle. Do you know how to get money maker. That's interesting! How do you determine this stuff mimo I mean Its hard to figure out how many penguins are needed when people are leaving the room and changing collor all the time! Yes I know how, but you should not break the CP rules. This may ruin your account. Mimo did not do this. Legoman098 figured that out. just saw it in the box dimentin at 4:30pm so mabey every 30 minutes? Mimo, I may not be able to Mod on friday and saturday. Im going skiing! LOL sorry. TAKE ME WITH YOU! I love skiing!!! PLEASE take me!! lol ;) And if you arent moding, like i am right now, you dont need to put your name and cpg mod btw. Ive noticed some things which are orange!! Hey Mimo, Club Penguin listened to you! Now you have to click on the language button on top of the Play to change the language! YAY!! FINALLY!! They finally fixed the supid select langage button thing!!! now you have to click it! THANK YOU CP! Posted this on another thing but....I need like a sign off, so I need you guys to think of ideas then tell me. I will pick the best three and we will vote! Thank you so much! I really apricaiate it. Mimo already mentioned the Puffle Party thing. As usual, he's already on top of it all. I don't think he mentioned the free item though... pretty cool! You have to have 10 other orange penguins in the room to. Money maker breaks the clubpenguin terms and laws of agreement. If you use it, you could be banned. COOL BEANS!!! i saw him at the box demention. it was floating on a box in the backround. everyone saw him and they where really quiet and they did the shocked emotion at the same time. lolz! You must have 10 orange penguins helping you. Yep, Mimo already posted that, but good eye. Every thirty minutes in the ski lodge coo-coo clock and the box dimension. Hope that helped! Actually, every fifteen minutes in the box dimension and every half hour in the Ski Lodge! You have to get 10 orange penguins there to see it. Hope it helped! Did you make sure that all penguins are orange? Try again, wearing orange as your color, with at least nine others who are orange! Good luck! I don't think you should do that. You could get banned forever! P.S. Mimo doesn't use it so he doesn't get banned. You don't have to tell us when and why you aren't going to not mod. We knew that! That is how we expected it. Wow I didn't notice the orange stripes. Good job noticing it. Cool! We knew it was there. I waited and waited but I didn't see it. Lucky! Mimo says hi back! :) Although that does happen, theres another orange puffle now in clubpenguin! (Gather some orange penguins at the ski village and see what happens on the ski lift!) Happy orange puffle hunting! Hi Mimo. I saw it like three times in a row! Cool huh?I saw it in the Ski Lodge,Box Dimination(or whatever its called)and now I see it in the Ski Village!When ever I see it I always put up a surprised face.LOL.And guess what? My penguin name is Mimo12309! thanks mimo! i got 10 penguins and it came! Mimo were you walking a green puffle because the balloons and stuff turns the color of the puffle you are walking. If you aren't walking any puffle then it is mixed. I think it`s shorter than thirty minutes, Hnwjanuary11 said about fifteen. The good thing about this location is that you don`t need 10 other orange penguins to do it! Waddle on! theres also brown look at the T in the "PARTY"........ brown puffle? MIMO please listen to this. 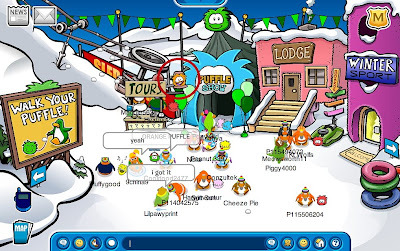 If you go onto club penguins homepage and look to the right you will see a pink puffle with green sunnglasse floating in the air. Have you noticed yet that if you go to the ski village, beech, town, snow forts, plaza or puffle feeding area, the decorations are the same color as the puffle you are walking, and if you don't walk a puffle the decorations are multicolored! there is also a orange puffle in the box dimension that comes after a loooooong time in a box and pops out!!!!!! until then waddle on!! hey mimo wouldn't it be really cool if we could dress are puffles?!!! Do you need to be wearing clothes or not? He already knows this, but hasnt yet posted this. I don't know if he is planning on posting it, or perhaps he wants to leave some discovery room for his fans? it's a cool thing thoough, right!? if you go to the lodge and look at the clock every half hour a orange puffle will pop out! i tried it and saw it but is there anywhere else you've seen it?! Hey mimo mager glitches are going through club penguin.Could they be working on a new mission. i think if you stay there the puffle will pop out every 5 minutes. it comes out every hour. It's every 15 minutes and Mimo already knows that. Good eye tho! I wish there was a orange puffle in the Town! has any one notice that the orange puffle is hiding in the ski lift chair in the newspaper that talks about the puffle and on the page when the penguin is looking for the puffle move your mouse near the box in the air and a black puffle shawdow is in it! I SAW HIM IN THE BOX DEMENTION HE COMES EVER HALF HOUR TO THE ROOMS WITH AT LEAST TEN ORANGE PENGUINS!!! i saw the orange puffle in the box dimension! Well, actually, I knda do. Look at the About Not to be Mods, because im in the catagory About to be a Mod(Thats ATB a CPG Mod for everyone that was wondring) I dont want to be taken off that. If I just stop modding suddenly with no explenation, Mimo might just take me off that list. Thats why. On the Skii village you have to have 10 dancing orange penguins for it to come. It is different, however, in the Skii lodge and Box dimension. In the box dimenson you just wait 15 mins for it to come and in the Ski lodge you have to wait 30 mins. It has a set timer so you could have just come in and it might appear. I'm a little late but I have a Question 4 every1... Where do you think the orange puffle's party room will be? I have a Rockhopper clip too. I got it like 4 months ago. It came in a book order at my school. You rock Mimo!